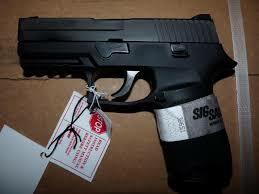 When you think Sig Sauer…what comes to mind? When most people think Sig Sauer they think bulky, high capacity, all steel guns carried by the military and the impressive lineage of years of service all over the world. The Sig Sauer P250 ($499.99) is one of the most popular, and most beloved firearms ever released by Sig Sauer…and it is one of the most versatile firearms currently on the market. If you’ve been curious about the P250, or just want to know if this modular beauty is for you, we’ve got you covered. We’re going to go over everything you need to know about the P250. Let’s start with the basics. *Specifications for the compact 9mm, the most common, and arguably most useful version of the p250. The Sig Caliber XChange kit lets you swap calibers quickly and easily. The P250 is also available in a handful of other calibers and sizes, and it’s easy to switch between them by swapping grip frames, slides, and other parts. 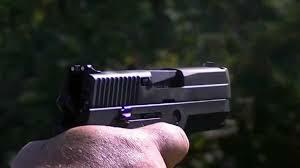 Price: The price of the p250 is around $50-$100 cheaper than other striker fired guns that compete for your business. Of course, this is going to vary based on state, store and political climates but it is no doubt cheaper and in many cases higher quality than other guns in this same market segment. Modularity: This was the original swappable handgun. There’s only a single serialized controlled part on this gun and it is an excellent option for someone who lives in a state or region where handguns are difficult to get but you want several different sizes, calibers, or grip dimensions. Caliber Selection: You can have this gun in all common self-defense calibers including the hard to find .357 sig and you can change them out in less than a minute once you’re good at it. 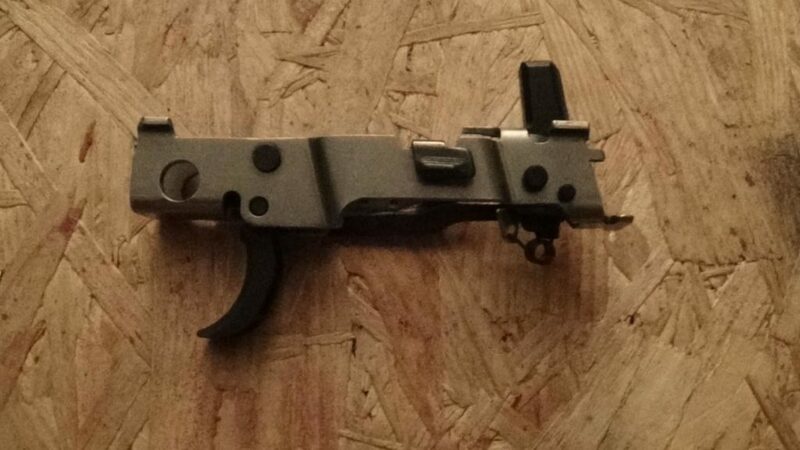 Modifications: This gun is a snap to modify because the serialized part that constitutes the “gun” comes out completely from the frame and the slide. This means you can ship your frame to get stippled, your slide to get sights…and use regular airmail for all of it. The “gun” can’t really be modified anyway, so you’re set! Take Down & Cleaning: The gun comes apart like a set of Legos. There are no tiny cracks or crevices grime and unburned powder can hide in and everything on this gun can be sprayed, submerged or scrubbed without any special tools or any difficulty. This is one of the reasons it’s my favorite pistol. It also looks pretty sharp if you like blocky hunks of metal. Chunky: Yep, it’s a Sig all right. This pistol could do for some weight watchers because it’s heavy, bulky, and refuses to fit underneath normal clothes. Best of luck CCW’ing this inside the waistband. Double Action Only Trigger: This is the heart of the design. Either you love this or you hate it. There’s no making it lighter, changing its travel or anything of the sort. It also is remarkably consistent with wear and tear on the gun. Whereas striker fired guns will smooth out and the trigger will change with use, this is like a fine revolver…it just is the way it always was, it will always be that way, okay? Lack of Accessories: The only accessories for these guns are from Sig Sauer. For better or for worse, depending on how you see it, what you see is what you get with these guns. Sights and holsters are about all you’re going to find. 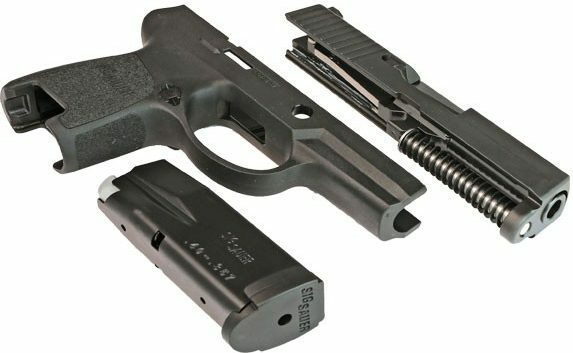 Lack of Upgrades: The p250 is made to work with parts designed by the Sig Sauer engineers. There aren’t a real “aftermarket” items for these guns that don’t come from the manufacturer so there’s not a ton of tinkering you can do. There’s not a trigger job, or an action blueprinting package available for these because they’re so modular and that design won’t allow for it. If you have a hankering for tinkering, this isn’t your pistol. Expensive Parts: The magazines, the caliber exchange kits, the sights, the holsters, they’re all expensive. Partially because it’s a somewhat uncommon gun, and mostly because Sig commands a premium price for their weapons and accompanying parts. Sig Sauer was one of the original companies that put themselves on the market by offering an alternative to the ubiquitous colt 1911. Their double to single action pistols like the p225, p226, and p229 became staples of military and police units around the world. Especially following the break-up of the Soviet Union, and the fall of the Berlin Wall, Sig Sauer was launched into making some of the finest pistols in the world. Now they make guns like the Army’s new p320 and before that the p250. The p250 was the first really good answer to police departments who needed a standard gun to equip officers with that could be modified quickly and easily. The term “Innovative” is thrown around in the firearms industry a lot but this pistol was really the jumping off point for many other designs, including the awesome p320. This is the entire reason to buy the gun. It’s FCU or Fire Control Unit, it’s a few pieces of stamped steel and some engraved numbers that make it the “gun.” At least, as far as the ATF is concerned. Legally speaking, the frame is plastic, the slide is just a piece of metal, and the magazines are still magazines. All those pieces can be legally bought and sold without a background check. They can all be sent and received through the regular mail, and all can be taken into states where pistols are highly regulated. Magazine restrictions notwithstanding of course. The list of benefits to this system is long and varied but more than anything else you get to have a gun that can shoot several different calibers, change grip sizes and do multiple things well without having to get a background check for multiple pistols because you only really have one. 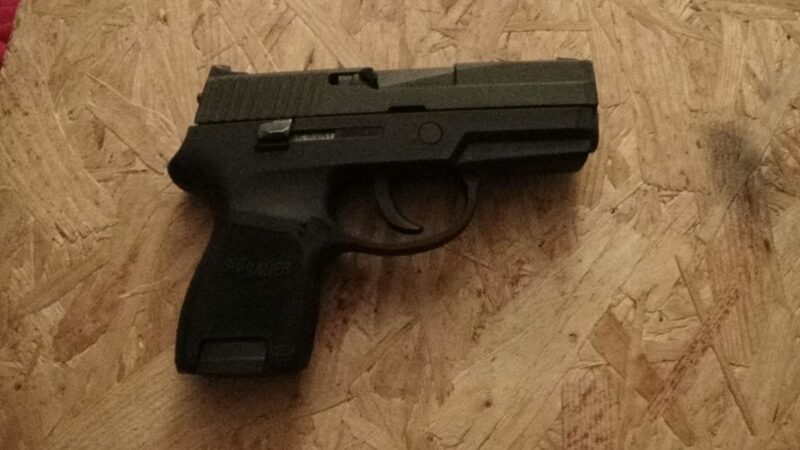 The grip frames of this pistol are getting better with the advent of the p320 which uses the same modular design but in a striker fired weapon. The benefit of the modular grip frames is that you can tailor the grips perfectly…and you can even practice your amateur stippling without worrying about ruining your firearm. You have a Large, Medium, and Small for the Full-Size and Compact. The Subcompact has a railed medium size and a small size with no rails. They also come in Black, Flat Dark Earth, and Olive Green. They all cost about $40 depending on where you buy them. Because these frames aren’t guns, they can also be shipped to custom houses for stippling and custom fitting for cheap. Want a full-size grip cut down for a compact frame? 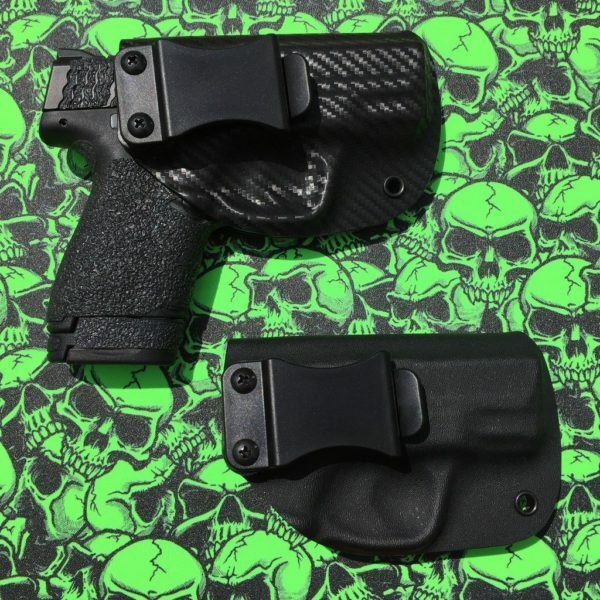 Want a subcompact medium frame reduced and stippled so you can put a light on your CCW? On the double! The modular non-firearm grips are the way of the future. This gun is chunky as all get out. The grip, the slide, the high bore axis…this gun does well for people with big hands or strong fingers. 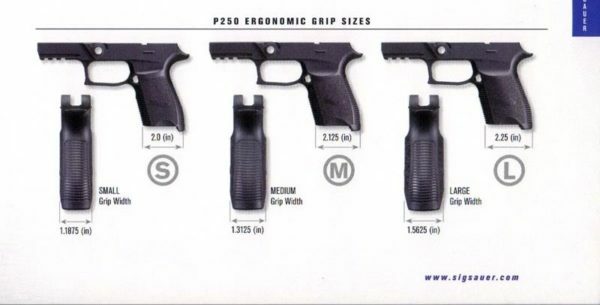 The full-size gun is huge, the “compact” is the size of some full-size guns, the “sub-compact” is the size of most compact guns. Oddly enough, almost every woman I’ve had shoot the sig p250, literally over 100, has loved the size of the p250 because it’s somewhere between a true compact and subcompact and there’s plenty to hang onto with the sub-compact, but it’s not quite as small as most in this category. The sights of the p250 pretty much must be Sig factory sights because of the design of the rear sight. 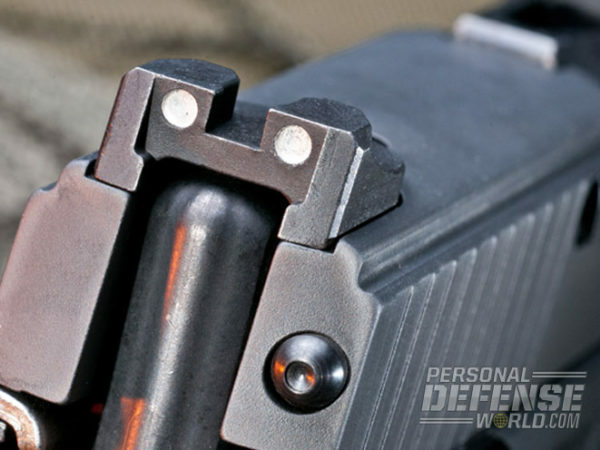 The base of the rear sight is shaped like a half-moon instead of the ubiquitous dovetail cut like the front sight. 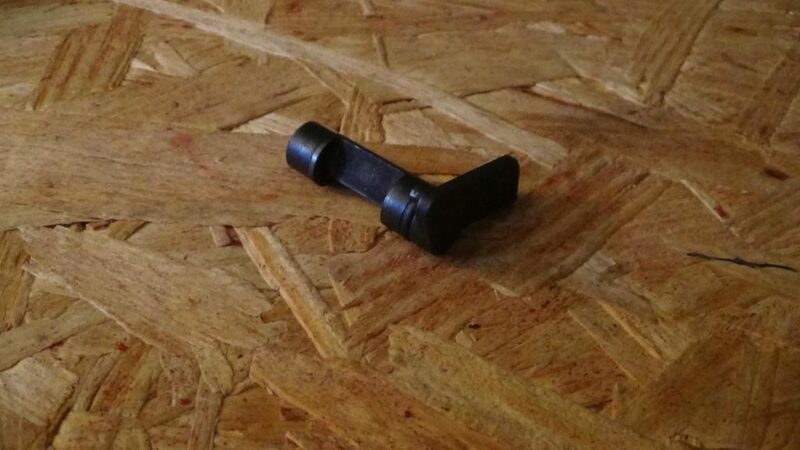 This is because the rear sight is part of the firing pin assembly and helps contain the spring. This is a weird design that left a ton of manufacturers deciding not to make sights for the gun. The modular design of the gun makes it come completely apart in seconds and all the “guts” of the gun are large, easy to access and easy to clean. I usually disassemble the gun, chuck the entire thing except for the slide into an ultrasonic cleaner and then dry and re-lube it. Every 1000 rounds I shoot through the gun I detail strip the slide and ultrasonic clean it as well. It’s exceptionally easy to clean and maintain. This is a darned reliable gun. Not only have I never seen a stoppage from it, but I also made it a point to ask my friends who own these guns to see if anyone had a malfunction and not once was the gun responsible for a malfunction. The only time I’ve never seen it go bang was with very old, poorly stored, Tula Ammo that was put through it and the primers had to be double struck. Even in a defensive situation, this would be a fairly minor, relatively speaking, malfunction. The gun has no feeding problems with hollow points, FMJ or any truncated ammunition profiles so no worries. There was a report of Sig factory magazines being too stiff to load to full capacity and the magazine getting jammed up with rounds inside the mag well and not making it to the feeds lips, but only with steel cased ammunition. This was most likely a friction problem caused by the polymer coating on the steel cases grinding together and causing problems…and its not something I’ve heard of beyond some forum posts. This is certainly a bet your life kind of gun. Great for duty or CCW use and won’t cause any problems. It should be noted that this pistol does seem to rust a bit easier than other pistols. The nitron finish wears off easy and rust can take in. Be sure to keep the gun clean or the reliability could drop significantly. Beware holster wear on this one. This pistol is on the level of other polymer hammer fired pistols on the market. It will certainly put rounds on target with any ammunition it likes but if you find a load the gun likes, you’re likely to find this gun is more accurate than its peers. Not quite on the level of a finely tuned 1911 or even the classic factory Sig Sauer p22x series like a p225, p226, p229, or p227, but more than acceptable for something like USPSA competition. My Sig p250 in .357 Sig likes Remington Golden Saber ammunition the best and will consistently shoot 1/2” holes at 15 yards if I do my part. Whatever you feed through these guns you’re assured a ragged hole if you can manage the unique trigger. To improve mechanical accuracy there’s not a whole lot to do except find a load the gun likes. The design of the firing control unit is standardized and trigger jobs, blue printing or tuning isn’t really possible. The Sig P250’s chief benefit is the grip…but it can also be a huge downside if none of them fit your hands. This is one of the places the pistol really lacks. 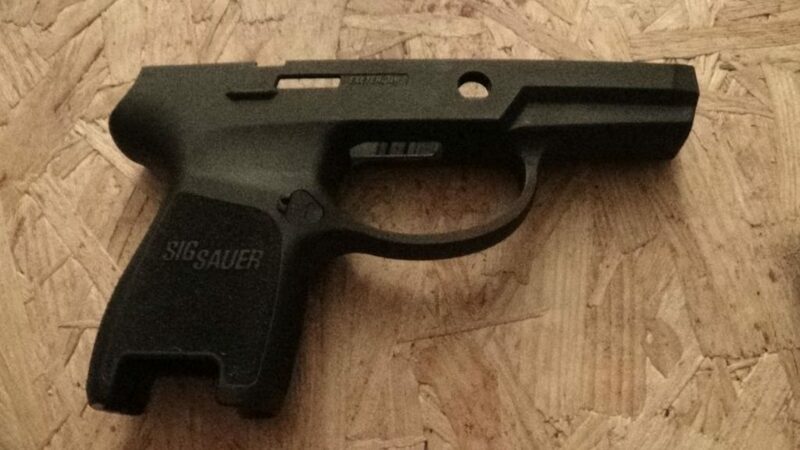 Unfortunately, this pistol has the traditional blocky Sig Sauer design. The problem is that the pistol has very little rounding in the grip and along the slide. This make sit top heavy and feel larger than say, a Glock 19, while being just .1” thicker in the slide and the grip. If you have large hands this is a blessing as the pistol gives enough real estate to wrap your mits around comfortably. The larger guns have beavertails which help mitigate the problem of an extremely high bore axis, which again, yay Sig! The next hit for ergonomics comes in the form of the trigger. It’s a million pounds heavy, and a million miles long. I t’s also huge. As in, the trigger face is gargantuan, which only makes it harder to pull. You must train with this style trigger if you’re going to CCW this gun, no way around it. 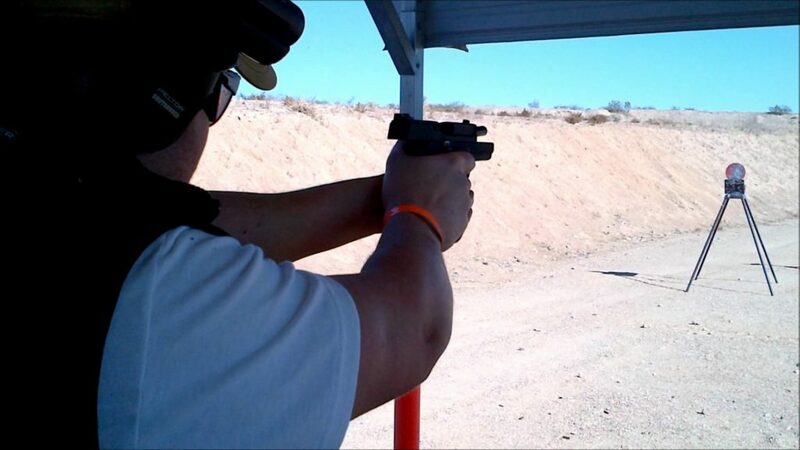 Once you master the trigger though you’ll find that you want it on other guns, the heavy crisp break and long travel makes for very precise shooting and trains you to focus on follow through. Right off the bat for customization, you’re going to have a hard time finding a good holster and sights for this gun. Essentially you have whatever Sig sells in their overpriced store, and whatever you can find on the custom market. Thankfully, the Sig kydex CCW holster, and the Siglite night sights are excellent and will work for 99% of people so I wouldn’t worry too much. Sig P250 custom holsters are your best bet if the OEM Sig holsters don’t work for you. Many of the medium to low end sight options other guns have, you don’t with this pistol because of the design of the rear sight. You also can’t have the slide cut for a mini-red dot because there’s not enough meat to hold the mounting screws down. If you’re going to love the p250 then you’re going to have to deal with some quirks. Namely bad ergonomics. It’s bulky and the trigger blade is gigantic with a stiff feel and extra-long travel. You’ll get used to it if you give it an honest chance with a few hundred rounds to get used to the trigger and feel, the gun will prove it’s self soon enough. The proof is in the pudding and the p250 has been proven, I saw it personally in the Boy Scouts. 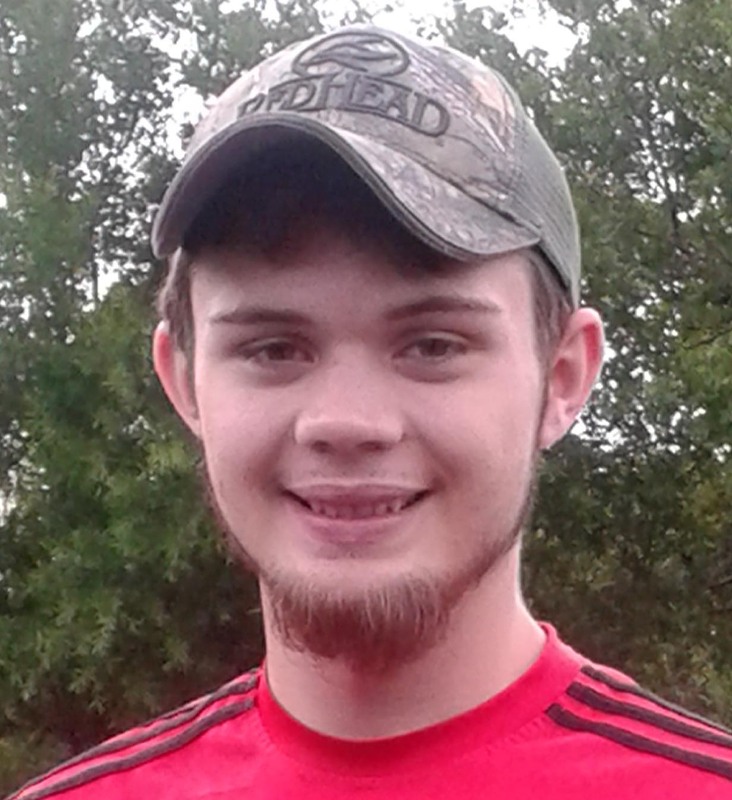 When the Boy Scouts of America decided to allow pistol shooting they shopped around for 9mm pistols to shoot and settled on the p250 for a number of reasons. The Sig P250 is a great gun for shooters of all ages. It proved to be ideal and served us with excellence and everyone who shot it, at one time well over 10,000 scouts at the National Jamboree, loved it. The p250 brings together slightly antiquated technology and new innovations that make using a gun easier. The grip frame swap is a permanent and dynamic shift from just a few back straps, even if it is more expensive. The ability to custom tailor a grip to your hand is going to be the way of the future for handguns and is the answer that many companies are looking for. The p250 is extremely underrated because of the long and heavy double action trigger, but it’s perfect for a person who wants to carry a gun, doesn’t trust a striker fired trigger and won’t carry a gun with an external safety. This gun just works. Well, it is a Sig after all. This gun is on track with just about every other polymer framed gun. At 7 yards, where it counts, you can expect a group of about 1” to 1 ½” but with ammunition it likes, if you do your part, a 3/8” hole is the norm. This is the only major hit. Most people are going to like the trigger like they like the snow, either love it or hate it. The gun is large all the way around and if you have small hands you may have trouble with the grip width and trigger no matter what. This gun looks like a space pistol, if you’re into it then it’s awesome. If not, the gun looks blocky and cheap. It’s a different strokes kinda thing. This gun was made to tinker with, from the interchangeable grip frame to the caliber exchange kits, this is tinker toys for big boys and the gun is a joy to set up, take down and play with. This is an excellent gun. The only “gripe” if you can call it that is the trigger, and blocky Sig-ish nature and feel. This is just a bang-up job from Sig Sauer and one of the best values in the firearm world. If you’re thinking about buying this gun, I couldn’t recommend it more. This is a very fine weapon and if you give it a chance, you’ll find that is on par with, if not even better than competing Gocks, M&P’s, or even XD’s. Buy it. You’ll be glad you did. For more of our favorite guns and gear…check out Editor’s Picks. For a Sig, the p250 is on the cheap end of a Sig scale. Some people really like the DAO design, the trigger pull is consistent, reliable, and never changes. A trigger that is harder to pull is by design, safer. Rule #2 is only relevant if a finger is the one and only thing that can possibly actuate a trigger. But it isn’t. Sometimes things happen. Weapons get dropped, clothing gets caught, equipment fails and people make mistakes. A heavier trigger provides a margin of error that light triggers do not. Some of us like hammer fired guns. I had my 250 for about a year now. Sig’s in general just work for me. This is a great handgun at an excellent price. I like DAO’s too. I can keep a bullet chambered and have no worries about accidental discharges. Finally, You pull the trigger and it shoots every time even with low end ammo. I would recommend a fair amount of dry firing before fine tuning at the range though. As noted, it will significantly improve your follow through for all other pistols you may own.